ASUS Zenfone Max Plus vs OPPO F5 Youth: Who wins? Two of the hottest phones right now are the ASUS ZenFone Max Plus and the OPPO F5 Youth. Both handsets come in the same mid-range segment with the former being marketed as the battery king while the the latter being pegged as the more affordable version of the OPPO F5. Respectively, the handsets come with an asking price of Php 11,995 and Php 12,990. Let's try to pit their specs sheet against each other to help you decide what to get on your next smartphone purchase. The ASUS ZenFone Max Plus has a smaller form factor than the OPPO F5 Youth. The Zenfone Max Plus touts a 5.7-inch FHD+ panel in contrast to OPPO F5 Youth's 6-inch FHD+ screen. 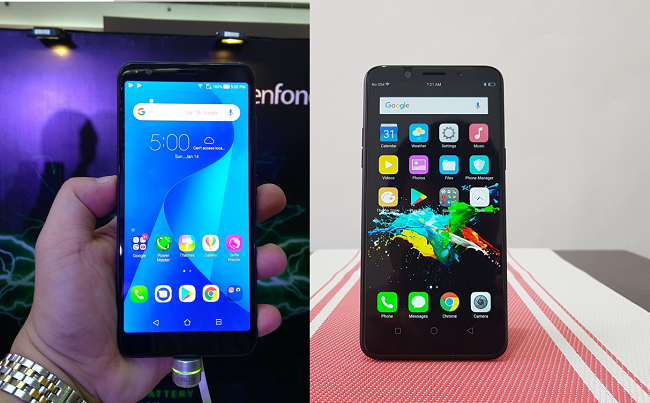 The ASUS ZenFone Max Plus is the company's first ever handset to sport an 18:9 aspect ratio while the OPPO F5 Youth succeeds the OPPO F5 under the company’s portfolio. In terms of internals, the ASUS ZenFone Max Plus ticks with an older chipset, the MediaTek MT6750T; while the OPPO F5 Youth boasts the MediaTek MT6763T aka Helio P23 SoC. Both chipsets are powered by octa-core processors but the OPPO F5 Youth comes with faster clock speed of up to 2.5GHz. It also comes with a newer GPU, the Mali-G71. Talking about memory, the ASUS ZenFone Max Plus is loaded with a beefier 4GB of RAM compared to the 3GB of RAM of the OPPO F5 Youth. When it comes to the camera, the ASUS ZenFone Max Plus shades the OPPO F5 Youth with its dual rear camera module - 16MP f/2.0 + 8MP f/2.4 wide angle. OPPO F5 Youth, on the other hand, has 13MP rear shooter with f/2.2 aperture. However, it edges the ASUS ZenFone Max Plus in the selfie department with its 16MP sensor, f/2.0 aperture and AI Beauty Technology. The ASUS ZenFone Max Plus is dubbed as the "Battery King" by the company due to the fact that it packs the biggest battery (so far) in a phone with 18:9 aspect ratio - that's 4130 mAh to be exact. On the other hand, the OPPO F5 Youth is powered by a decent 3200 mAh battery. The ASUS ZenFone Max Plus is more affordable at Php 11,995 while the OPPO F5 Youth is not far at Php 12,990. Both phones are now available in your selected gadgets store nationwide. As usual, I will not say who wins between these phones, I pass the judgment on you based on the given facts above. But if you wish me to answer that query, you can hit me at @pinoymetrogeek anywhere in social media.